The Serenity, one of four luxury-class ocean ships in Crystal Cruises' relatively small fleet, has a passenger capacity of about 1,000. 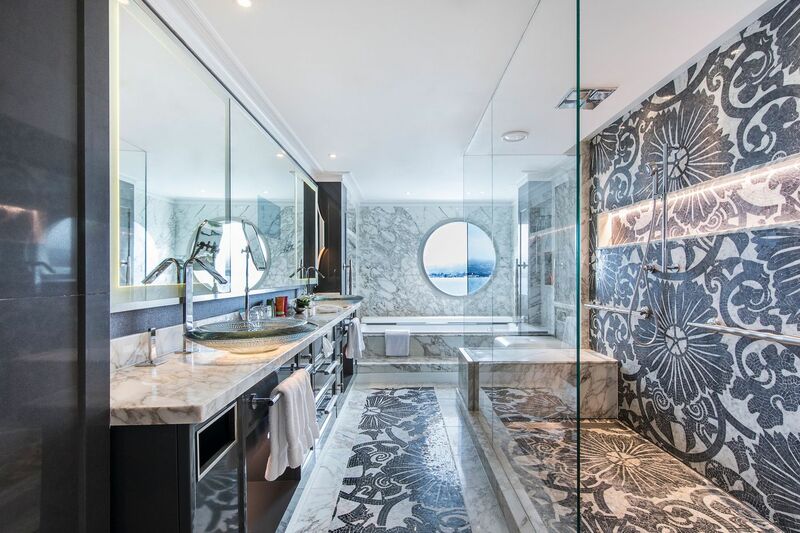 The bathroom in the accommodation known as a Crystal Penthouse. We’re no strangers to cruises, but this time we wanted something different. Especially in the upscale cruise sector, travelers now have more options, with far better products and experiences than previously offered. And that’s what led us to an extended cruise. Until fairly recently, most cruise lines traditionally offered standard, 7- to 10-day itineraries. But longer trips have gained in popularity, in part because of the realities of most vacations: the time required to get to the destination and back, the time needed to acclimate and just relax, and then too quickly the realization that the vacation is almost over. The Serenity, one of four luxury-class ships in Crystal Cruises' relatively small fleet, has a passenger capacity of about 1,000. We recently took an unforgettable 25-day trip on Crystal Cruises, sailing from Charleston, S.C., to Maui, Hawaii, aboard the Serenity, one of four luxury-class ocean-going ships in Crystal’s relatively small fleet. (It also has five river cruise ships.) Since our trip, Serenity has undergone a complete refurbishment (in November 2018), as has sibling ship Symphony, leaving both with a guest capacity of 980, down from the 1,070 for our cruise, and far below the 5,000 or more that megaships from, for instance, Royal Caribbean, can accommodate. To say this extended cruise was different from a typical voyage is a little like saying a three-week vacation is different from a long weekend. Royal Caribbean’s Harmony of the Seas can carry 6,780 guests, plus a crew of 2,100, dwarfing Crystal's Serenity. The advantages to an extended cruise, she says, include immersion in a destination, unhurried rest and relaxation, and the opportunity to genuinely get to know other guests. "The camaraderie can be delightful." With the extra time, we really did get to know our fellow passengers — and crew members — to the point that some came to feel like extended family. Because almost everyone is going to be aboard for awhile, all but the most introverted person can find a genuine bond with others you meet walking the track or in the dining room or attending the nightly entertainment, for instance. We’ve kept in touch with those new friends. Tom Stieghorst, senior cruise editor at Travel Weekly, notes that baby boomers, who are retiring at the rate of 10,000 per day, as a group previously had the time and money to take only seven-day cruises. Now, he says, that audience has matured and aspires to longer vacations. Crystal, of course, is not the only upscale cruise line to offer such options. Other well-known lines are Regent Seven Seas Cruises, Oceania Cruises, Windstar Cruises, and Silversea Cruises. These cruises are not inexpensive — on Crystal, 15-plus days costs about $4,750 — but considering the service and amenities, the price is not out of line. On our 25-day cruise, we saw four Broadway-type productions that were show-stopping performances. We also saw six comedians, two magicians from the Magic Castle in Los Angeles, and several pianists (including Carnegie Hall headliner Tian Jiang), violinists (Claudia and Laszlo Pap), and vocalists. The entertainment offerings also included Crystal’s Ambassador Dance Hosts — professional ballroom dancers who provide lessons to couples. You simply can’t match this variety of talent on a standard, briefer cruise. The ship's Computer University at Sea offers extensive classes on a variety of technology developments, internet applications, mobile device learning, and social media management. We made use of the ship’s Computer University at Sea, which, because of the longer time available, offers extensive classes on a variety of technology developments, internet applications, mobile device learning, and social media management, which we found especially rewarding — and fun. We had the opportunity to roam 13 ports of call on our 25-day itinerary. To get from the Atlantic Ocean to the Pacific, we traveled through the Panama Canal — one of the great engineering marvels of the world, which was the subject of one of the on-board lectures over two days. Panama City itself is a fascinating mix of old and new. We also enjoyed Cartagena, Colombia; Caldera, Costa Rica; and Cabo San Lucas, Mexico, in addition to Los Angeles and Lahaina, on Maui, our last stop. During the trip, we ate not just superior food available throughout every day but cuisine customized to reflect the cultures of almost all the ports of call, including empanadas in Cartagena and tortas ahogadas (“drowned sandwiches,” a mix of shrimp and pork in spicy tomato sauce) in Puerto Vallarta, Mexico. Our cruise offered more than access to the gym to burn off all those calories. There were wide-ranging fitness classes, including body contouring and Pilates, plus classes on physical therapy, acupuncture, weight control, and preventing muscle injuries. But let’s get back to why we vacation: To get away. To experience new things. To relax. To learn. With an extended cruise of 25 days, all those things are not just possible, but almost impossible to avoid. Debbi K. Kickham, a former editor of Robb Report Magazine, can be reached through her website, GorgeousGlobetrotter.com. William D. Kickham is a lawyer in Boston.